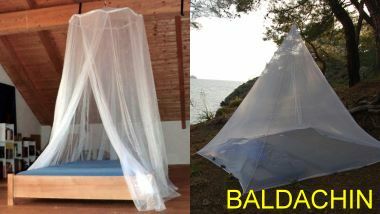 Box-shaped nets come with at least four tapes at the upper edge to suspend them from the ceiling or span them between walls. They fall down straight at the sides, keeping the netting well away from body parts. In contrast, bell nets are tapered in shape. 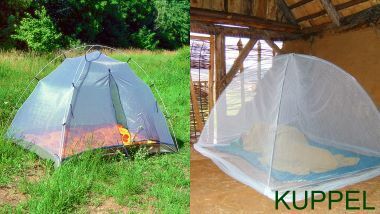 In these nets, the netting falls away at an angle from a small roof section that is held in shape by a ring, an umbrella-mechanism frame or a folding spreader, meaning the net can be suspended from a single point. The smallest type of bell net has a pyramid shape. 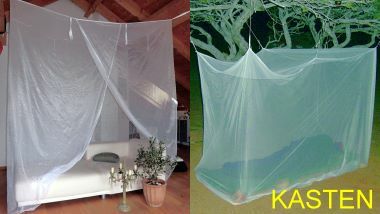 Free-standing mosquito nets do not require suspension as they consist of a dome with corded poles. The netting is laid over this frame and secured to it with ties.